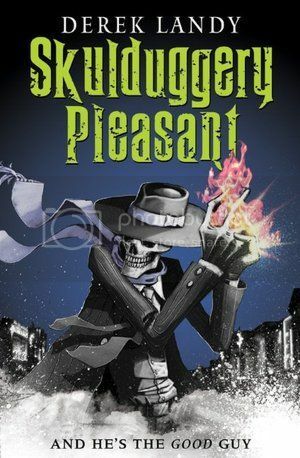 Book Summary: Meet Skulduggery Pleasant. Sure, he may lose his head now and again (in fact, he won his current skull in a poker match), but he is much more than he appears to be—which is good, considering that he is, basically, a skeleton. Skulduggery may be long dead, but he is also a mage who dodged the grave so that he could save the world from an ancient evil. But to defeat it, he'll need the help of a new partner: a not so innocent twelve-year-old girl named Stephanie. That's right, they're the heroes. So Stephanie and Skulduggery set off to find the Sceptre, fend off the minions of the bad guys, beat down vampires and the undead, prove the existence of the Ancients and the Faceless Ones, all while trading snappy, snippy banter worthy of the best screwball comedies. To be honest, I was skeptical about picking this one up. It had been recommended to me by a friend and the last time I listened to them, I end up with a book from the Twilight universe. This one seemed a bit more of Harry Potter with a Dark Lord lurking within the shadows and Stephanie as Harry Potter. Stephanie is brilliant, twelve, and a killer of the deadpan. She has inherited her late uncle's estate and when someone breaks into the home to do away with her, her theory of her uncle being murdered for something isn't so farfetched now. She meets her Uncle's friend, Skullduggery, and finds herself whisked into a world of magic. They were a great pair and they seemed to be able to match each other perfectly (and not in the pairing sort of way). I really enjoyed this book immensely. It was funny and really sucked you into the world until the very end. Stephanie and Skullduggery worked as team very well. They were humorous together and complimented each other very well. I think my only slight problem was I would have loved spending more time knowing the other characters within these pages and perhaps with the next book I just might. I recommend this book to anyone who loves the Harry Potter series.